What tasks do we expect a coiffe/capsule module to perform. That it is a stable platform during launch and flight to maximum altitude/apogee. Capable of coping with 60>400g launch acceleration loadings without deforming plastically. Support and protect a recovery system>Parachute or other. Allow the rapid deployment of the recovery system>parachute with 100% reliability. In all weather conditions: rain, snow / ice sub zero temperatures and sunshine/heat. Provide a stable aerodynamic form that is both light and of low aerodynamic drag coefficient. Coiffe module that is easy to change from one launcher to another. Stable in strong cross wind conditions. Is simple and easy to use. Permit fast pressure compensation during the different phases of the flight. Control static electricity. Needs to be discharged and kept to a minimum. Will breath and not encourage condensation. Parachute design and the choice of materials. In the overall objective of keeping rocket mass to a minimum the specification of parachute diameter and cord support system should be kept to a minimum. The decision to use multiple parachutes for coiffe and launcher will set the size or volume of coiffe required. The memory and packing volume of the parachute material needs to be quantified. 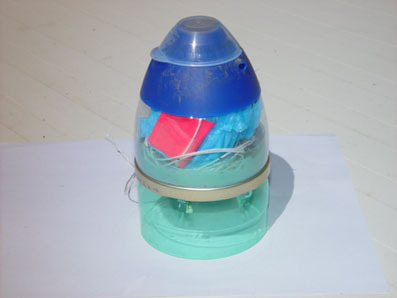 This can be done simply by taking the parachute and folding it as you would before placing it in the capsule /coiffe and recording the time it takes to expand. Determine the packing volume before and after folding by placing the folded parachute into the base of a plastic bottle with the neck part removed. Then leave it for the time you would normally take to pressurise and launch the rocket after installing the parachute and add the expected flight time say 2minutes plus 5seconds Checking the change in packing volume with time. A direct comparison can be undertaken by folding two similar parachutes made of different materials and compressing them one in each hand. Then release them simultaneously and compare which extends first. Some materials have good memory and straighten out almost immediately after being folded. Whilst others will remain folded without too much spring back after they are placed into the coiffe. Test fold and install the parachute into the nose cone/coiffe and see if it expands beyond the opening of the coiffe once released. Cut off the bottom of the bottle to the height you think will be adequate for a coiffe volume and place the cord system and folded parachute in position. Test until you are satisfied that the coiffe volume is correct and enables the d’coiffe angle required. This will determine the volume of coiffe required. Another more precise measurement is to make a simple d’coiffe angle meter . This is simply made by sticking the cioffe module base to a ruler or suitably rigid strip of material and measuring the rotation angle/ height to which one end is raised before the coiffe and parachute releases from the base. Different methods of parachute folding can be tried and compared. Similarly the position of the balance weight within the nose/coiffe can be varied to see how it affects the release angle. Always make sure that the parachute is clean and dry. Before lightly sprinkling with talcum powder prior to folding and installing into the rocket nose cone. Aerodynamic shape and form of coiffe/nose cone and base module. Stability under different loading conditions. Coiffe location to base plate. Degree of freedom about location collar. Fit tolerance. Flight adhesion to the launcher mass. 'fall away'. Relative mass. mass of coiffe mc relative to launcher mL. Relative momentum during flight. Relative aerodynamic drag between nose cone and main rocket body with fins. Aerodynamic pressure drop. Pressure differential between external and the internal pressure found inside the coiffe at any point during the flight. Pressure compensation during launch and climb is very important. Ratio of internal coiffe surface area to pressure compensation hole area and the quality of pressure drop dp. Transmitted to the internal surface of the capsule/coiffe. Absence of damage or wear to nose cone. No cracks or damage due to impact ; buckles ,holes etc. Launch shock loads and accelerations. Chute material memory That is its ability to return to its original shape. Presence and concentration of electro-static charge. Axial position of nose mass . Effect of pendulum or gimble control of nose mass. Weather/meteo conditions. wind velocity, rain, snow ice, air temperature. Static measured coiffe module d’coiffe angle. Tilt test release angle. Cleanliness., dryness of coiffe interior. and exterior. Wear and damage to chute or cord assembly. Low surface friction. Absence of rough edges along cut lines or drilled /melted holes. 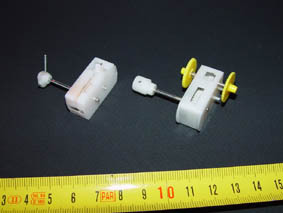 Absence of surplus adhesive or adhesive tape that has its adhesive face or edge exposed. Parachute cord coil arrangement. Interference of complex multiple chute cord systems at deployment. Animation of Soyuz MetOp satellite launch and de-coiffe release. Pressure release system with location collar bonded to shock plate with pressure compensation holes linking the interior of the nose cone to ducts formed by deformations in bottle base. Friction or fit tolerance variation. Ex. 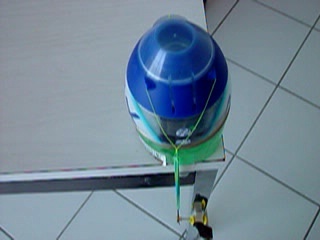 Balloon compressed by sliding fit of coiffe over top of launcher module diameter. Sliding fit becoming an interference fit when launcher is pressurised. Fixed line trigger. Cone coiled line attached to rocket that triggers release at a pre set height. Electronic pressure reading altimeter with output signal to release parachute at highest point of flight. Nose cone seperation into two halves by internal pressure impulse. Full scale rockets use a series of small explosive charges to unzip the two halves of the nose cone and leave the satellite payload ready for orbit release.